Our terrace overlooking the sea, where the sky is the roof! When the doors of the elevator open on the fifth floor, we're sure you'll be left speechless. The Hotel Cà Bianca rooftop is secluded and exclusive, ideal for those seeking quiet moments away from the busy summer streets of Riccione. The 260 m2 terrace is completely furnished in white and with a Mediterranean style, providing a unique view of the sea and further inland, especially at sunset, when the colours of the sea and hills are set against the red sky. As testament to the high quality of our services, in this area the hotel also provides its guests with ergonomic sun loungers, umbrellas, outdoor seating areas and, upon reservation, our new Jacuzzi with water heated to 30°C, where you can enjoy the view while benefiting from the healing effects of the water and the rose essential oil aromatherapy and chromotherapy. 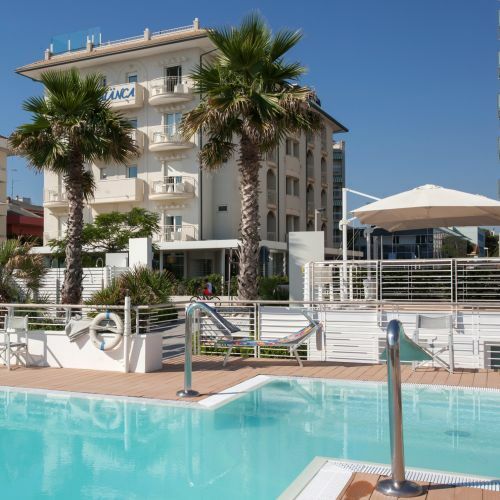 In the evening, however, the rooftop turns into the ideal place for meetings and conferences connected with wellness, under the stars and organised by the staff of the Hotel Cà Bianca in Riccione.